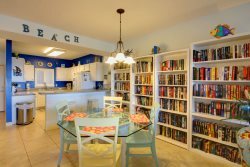 Perdido Towers, far from the crowds, located on brilliant white beaches, nestled between blue-green waters of the Gulf of Mexico and the peaceful solitude of Old River. 500’ of beachfront to enjoy from your balcony or a walk on the beach. Keypad entry to the buildings provides security and units have a private or semi-private entry from the elevators. This 6th floor,1400 SF, East end unit with spectacular views and floor-to-ceiling windows and doors overlooking the beach has ceramic tile throughout. Each bedroom has a private bath which makes it ideal for two couples. This unit also has built-in captain's bunks for extra sleeping. A charming unit with lots of extras. Electronics include 42” TV, DVD in Living Room and LCD TV’s in both Bedrooms. The rental, check in and check out process was streamlined and smooth. Perfect after a day of flying! This property is beautiful, peaceful, clean and elegant. This was our third stay in this tower and we loved it. The condo was clean, well appointed and comfortable. The pool area was also immaculate and well tended. Beach was beautiful. We will be back. Overall our stay was wonderful. The condo was beautiful & very clean. We also enjoyed having the beach on one side & a dock on the in-land side. Michelle is wonderful. She remembers you from year to year and is very helpful. We arrived earlier than stated check in time. We were interested in watching a football game. The guest services team went above and beyond to make that happen. We were in the condo in time for the kick off of that game. Beautiful condo with a few maintenance issues. Just every day wear and tear but do need to be addressed. View was amazing!! Another great vacation with Perdido Realty and Perdido Towers. Wonderful Experience - Love spending time here!